Tags: Ferozi, Front Open, Lehenga, Pink, Red, Wedding Outfit. Pinkish red pure chiffon front open shirt. Shirt has been adorned with embroidered border on front and side slits and round neckline. Embellished motifs implemented on both sides before hemline. Finished with ferozi banrsi piping. Concealed with back /side (hidden) zip closer. Plain pure chiffon pinkish red dupatta. Dupatta is finished with ferozi banrsi piping. 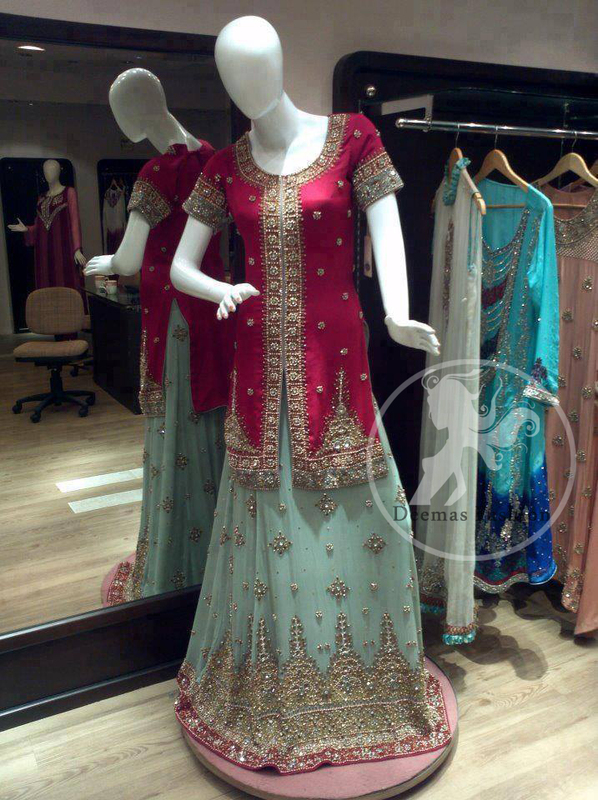 Ferozi pure chiffon lehnga. Embellished border is implemented on hemline. Before hemline embellished motifs implemented all around the lehnga.Small and lagre ornamental motifs scattered all over the lehnga. Finished with pinkish red banrsi piping.Fully elastic or fixed belt options.